Jatayu And Icarus :In Greek mythology, Daedalus was a master inventor and craftsman who designed wings that could be worn by humans so they can fly. His son Icarus was fitted with wings, and Daedalus instructed him to fly low as the wax wings would melt in proximity to the sun. After he starts flying, Icarus forgets himself in the ecstasy of flight, wanders too close to the sun and with the wings failing him, falls to his death. In Hindu mythology, Sampati and Jatayu were the two sons of Garuda – represented as eagles or vultures. The two sons always competed with each other as to who can fly higher, and at one such time Jatayu flew too close to the sun. Sampati intervened, protecting his little brother from the fiery sun, but gets burnt in the process, loses his wings and falls to the earth. Theseus And Bhima: In Greek mythology, to prevent Crete from waging war on Athens, a treaty was signed that every nine years, seven young men and seven young women from Athens would be sent to Crete, into the Labyrinth of Minos and ultimately feasted upon by the monster known as the Minotaur. Theseus volunteers as one of the sacrifices, navigates the Labyrinth successfully (with the help of Ariadne) and slays the Minotaur. 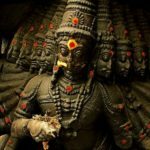 In Hindu mythology, at the outskirts of the city of Ekachakra lived the monster called Bakasura who threatened to destroy the city. As a compromise, the people agreed to send a cartload of provisions once a month to the demon, who ate not only the food, but also the bulls that pulled the cart and the man who brought it. 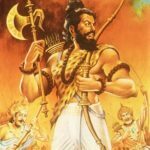 During this time, the Pandavas were in hiding in one of the houses, and when it was the house’s turn to send the cart, Bhima volunteered to go. As you can guess, Bakasura was killed by Bhima. Ambrosia and Amrit: The Ambrosia in Greek Mythology, and the Amrita in Hindu Mythology were the food/drink of the gods which conferred immortality on those who consume it. The words even sound alike, and it’s possible that they share an etymology. 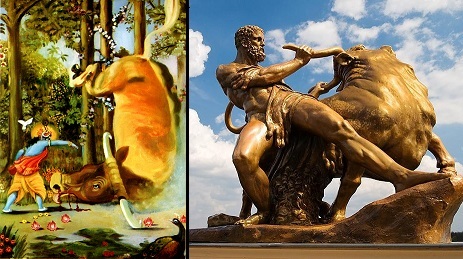 Kamadhenu And Cornucopia: In Greek mythology, the newborn Zeus was nursed by many, one of which was the goat Amalthea who was considered sacred. Once, Zeus accidentally breaks off Amalthea’s horn, which became the Cornucopia, the horn of plenty that provided never-ending nourishment. In Hindu mythology, cows are held sacred as they represent Kamadhenu, usually depicted as a cow with a woman’s head and containing all the deities within her. The Hindu equivalent of the cornucopia, is the Akshaya patra that was provided to the Pandavas, producing unlimited quantities of food till they were all nourished. Mt.Olympus and Mt.Kailash : Most major gods in Greek mythology take up residence in Mount Olympus, a real mountain in Greece, believed to be the realm of the gods. One of the different lokas in Hindu mythology where deities resided was called the Shiva loka, represented by Mount Kailash – a real mountain in Tibet with great religious significance. Aegeus And Drona: This is somewhat of a stretch, as the common theme here is that a father is led to falsely believe that his son is dead, and as a result dies himself. In Greek mythology, before Theseus left to kill the Minotaur, his father Aegeus asked him to raise white sails in his ship if he returns safely. After Theseus successfully slays the Minotaur in Crete, he returns to Athens but forgets to change his sails from black to white. Aegeus sees Theseus’ ship approaching with black sails, presumes him dead, and in an uncontrollable bout of grief jumps off the battlements into the sea and dies. In Hindu mythology, during the Kurukshetra War, Krishna comes up with a plan to defeat Dronacharya, one of the greatest generals in the enemy camp. Bhima kills an elephant called Ashwattama, and runs around celebrating that he has killed Ashwattama. As it’s the name of his only son, Drona goes to ask Yudhistra if this was true – because he never lies. Yudhistra says that Ashwattama is dead, and as he continued saying that it’s not his son but an elephant, Krishna blows his conch to muffle Yudhistra’s words. Stunned that his son has been killed, Drona drops his bow and using the opportunity Dhrishtadyumna beheads him. War on Lanka And War on Troy: A thematic similarity between the War on Troy in the Iliad, and the War on Lanka in the Ramayana. One was incited when a prince abducts a king’s wife with her approval, and another when a king abducts a prince’s wife against her will. Both resulted in a major conflict where an army crossed the sea to fight a battle that destroyed the capital city and the return of the princess. Both wars have been immortalized as epic poetry singing the praises of warriors from both sides for thousands of years. Afterlife and Rebirth: In both mythologies, the souls of the deceased are judged according to their actions and sentenced to different places. Souls judged as wicked were sent to the Fields of Punishment in Greek mythology, or Naraka in Hindu mythology where they were punished as befits their crimes. Souls judged as (exceptionally, in Greek) good were sent to the Elysian Fields in Greek mythology, or Svarga in Hindu mythology. The Greeks also had the Asphodel Meadows for those who lived ordinary lives, neither wicked nor heroic, and Tartarus as the ultimate concept of Hell. Hindu scriptures define various planes of existence as lokas among other things. The important difference between the two afterlives is that the Greek version is eternal, but the Hindu version is transient. Both Svarga and Naraka last only till the duration of the sentence, after which the person is reborn, for either redemption or improvement. The similarity comes in that consistent attainment of Svarga will result in a soul achieving moksha, the ultimate goal. Greek souls in Elysium have the option to be reborn three times, and once they achieve Elysium all three times, they are sent to the Isles of the Blessed, the Greek version of Paradise. Also, the entrance to the Greek underworld is guarded by Hades’ three-headed dog Cerberus, and the entrance to Svarga by Indra’s white elephant Airavata. Demigods and Divinity: Even if the concept of gods being born, living and dying as mortal beings (avatars) is not present in Greek mythology, both sides have gods descending among men for short periods of time for various reasons. There is also the concept of children born to two deities becoming deities (like Ares or Ganesh), and also the idea of demigod children born to a god and a mortal (like Perseus or Arjuna). 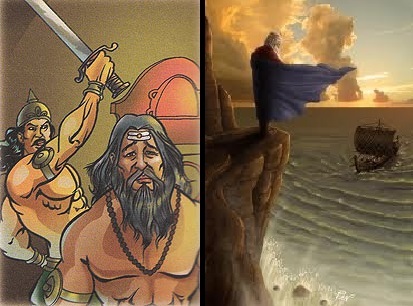 Instances of demigod heroes raised to the status of gods were also common (like Heracles and Hanuman). 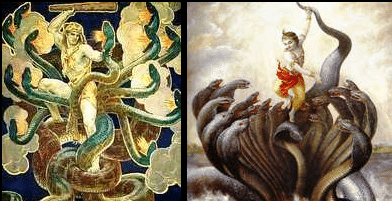 Heracles Fighting With Serpentine Hydra and Lord Krishna Defeating Serpent Kaliya. Lord Krishna didn’t kill Kalingarayan (Serpent kaliya), instead he asked him to leave the Yamuna river and go away from Brindavan. Simialrly, Heracles did not kill Serpent hydra, he only placed a huge stone over his head. Killing of Stymphalian And Bakasur: The Stymphalian Birds are man-eating birds with beaks of bronze, sharp metallic feathers they could launch at their victims, and poisonous dung. They were pets of Ares, the god of war. They migrated to a marsh in Arcadia to escape a pack of wolves. There they bred quickly and swarmed over the countryside, destroying crops, fruit trees, and townspeople. They were killed by Heracles. Bakasura, the Crane Demon, simply got greedy. Lured by Kamsa’s promises of rich and swanky rewards, Bakasura “tricked” Krishna to come close – only to betray the boy by swallowing him. Krishna forced his way out of course and put an end to him. Killing of Cretan Bull And Arishtasura : Cretan bull had been wreaking havoc on Crete by uprooting crops and leveling orchard walls. 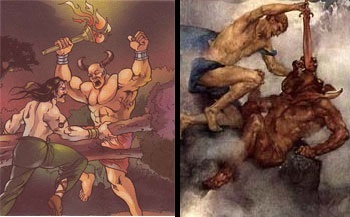 Heracles sneaked up behind the bull and then used his hands to strangle it, and then shipped it to Eurystheus in Tiryns. Killing of Horses Of Diomedes and keshi : Horses Of Diomedes were four man-eating horses in Greek mythology. Magnificent, wild, and uncontrollable, they belonged to the giant Diomedes, king of Thrace who lived on the shores of the Black Sea. Bucephalus, Alexander the Great’s horse, was said to be descended from these mares. Heracles the Greek hero slays the horses of Diomedes. Keshi the Horse Demon was apparently mourning the loss of so many of his fellow rakshasa friends, so he approached Kamsa to sponsor his battle against Krishna. Shri Krishna Killed him.